Have you heard the news? We’re goin’ on a cruise! In February 2012, OWHers can take a vacation from the doldrums of winter – and head for the Caribbean for some crafty goodness. We’ll leave from Fort Lauderdale on February 4th for 8 days on the high seas! Each weekend we’ll post some fun cruise details here – ports of call, amenities on board, classes, goodies that are donated. So be sure to subscribe by email to this Homefront Blog and keep up with the news! We’ll be setting up an email list with just those who sign up, so we can get lots more info to you about plans coming together. Pssst Many many thanks to our OWH cruise coordinator Sherry – she’s done great work on this so far! And the folks at Cruise and Crop have been so wonderful to work with – thank you Cherie and Gail! Our plan is to get everything we need to make cards donated – that means you can pack your bikini (time for Sandy to start the diet!) and your coloring medium (we may not get enough for everyone to have a set, so bring what you like to color with)…..and just show up in our conference room to make cards! There will be tables for us to work at, tools to share, and goodie bags for everyone with the basics. We’ll offer classes all week long, both in our room and out on deck, just to encourage us to get out and about. Stay tuned – we’re going to be announcing the classes and the teachers as we get things lined up! And as for our ship, the Navigator of the Seas, it has something for everybody: mini golf, ice skating, day spa/fitness, full size basketball court, golf simulators (spouse alert! ), Adventure Ocean youth activities (keep the teens busy while we make cards), Casino Royale, various restaurants and lounges including Johnny Rockets 50’s style restaurant, and internet (Sandy was worried!). Major wow factor! And so reasonable when you compare it to 8 nights at a land-based hotel. We’re hearing about a number of ladies who want to go, but will be travelling solo. Email sherry@operationwritehome.org if you’d like some help connecting with someone – or leave a comment below and check back to see who else is looking for a friend to share a room with. If you’re tantalized and ready to roll, sign up right away….the first 25 people will get a special gift from OWH! We want this cruise filled with 100 OWHers – but it’s open to anyone who signs up, so be sure to reserve your spot on the list quickly. Welcome to this week’s Sketch Challenge! I hope your July was great – and I hope you got your Beat the Heat challenge cards sent in! Before we get to the sketch, I have something for you! The awesome Allison G has helped us out by putting our sketches into a downloadable PDF file! You can copy the file to your PC to refer to the sketches anytime, or you can even print the 18 page document to keep sketches handy. Thanks so much, Allison! I have also placed a link to this document on our Sketch collection page. This week’s sketch is a little bit “out of the box,” but hope y’all will like it and make something beautiful with it. Reminders! 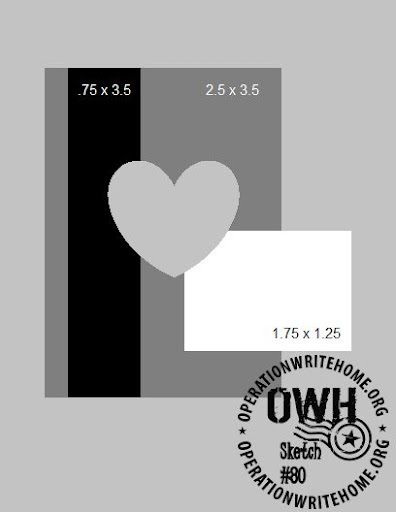 All OWH sketches are designed for A2 sized cards (4.25″ x 5.5″) and the heart shape indicates the embellishment of your choice, it doesn’t have to be a heart. 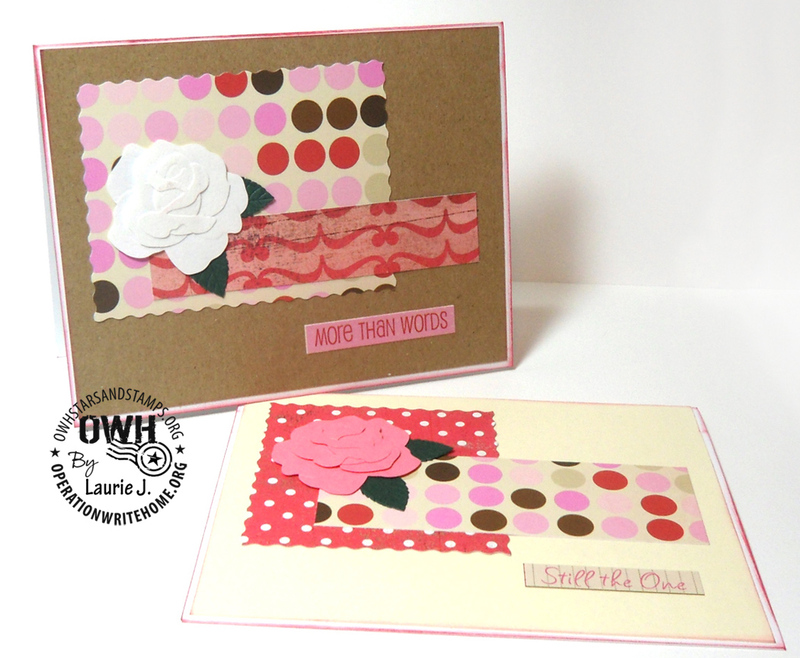 Our sample for this week was made by the talented Yvonne! She has a blog called One Creative Momma (and she is!) so be sure and visit her and leave her some love. Thanks so much for the beautiful sample card, Yvonne! Okay, everyone, go see what you can do with this sketch! Don’t forget to link your blog or gallery entry back here so we can all see! Thanks for all the cards! -B.R. I love these cards! Thank you so much. -L.
Really appreciate the cards! -Lt Col D.
Great cards, thanks! CPT C.
Thx 4 D cards! -J.B.
Love the cards! Thanks for your support. Happy 4th! CPT M.
Thank you so much for the cards! 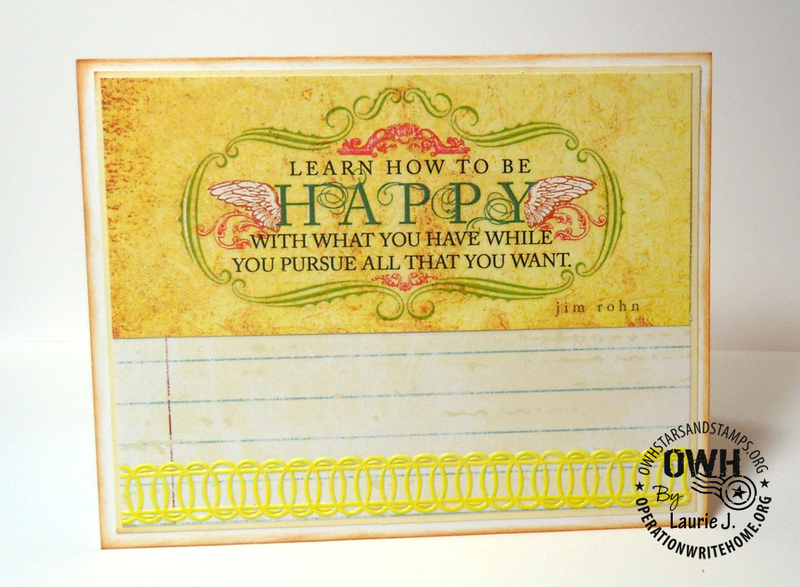 -LTCOL L.
I am a card-a-holic and I love these carsd. Thank you so much, they mean a lot! L.
Appreciate all the support! Maj J.R.
Love the cards, thank you! Maj C.C. Thank you for your support, 2LT H.
God bless you, SGT L.
I wanted to personally thank your organization for the cards that were supplied through a soldier, PFC S.M. I am a single mom who writes to her family and friends a lot. It’s such a comfort to me to let them know that I’m fine in such a creative way. My children’s dad is having problems, and my 15 and 16 year old are stuck in the middle of all of it. The creativity in those cards is beyond words. The deployment has been hard on them to say the least. I’m a Christian mom who knows every day that God loves me beyond all measure and truly supplies the needs of my family and me daily. My children will be staying with their dad this next year til June 2010 until my return. Your beautiful cards help to lessen the blow of all the challenges that exist for them at this time. With a very sincere and thankful heart, God bless you all! This is Lesley T’s daughter. I wanted to stop and say thank you for all the beautiful cards! Me and all the girls love them! The first night I had found out some bad news about my grandma and after I got back, me and some of the girls were going through the cards and it made me laugh and smile! You and your crew are doing some wonderful things for us. Thank you so much! I really want to thank you for the support you give us with finely crafted cards and letters of encouragement. Sadly, I admit you are much more diligent in your support to us than I have been in showing my gratitude. Please do not let my complacency dissuade your efforts. I assure you all of us are very appreciative and the collection of cards always goes quickly! While I would like to share a picture of us with your cards, I work in a classified environment and we are not allowed portable electronic devices. My friends and family have greatly enjoyed the quality cards I’ve used to correspond with them, all the way back to Halloween. That’s when I first came across your cards (in a package to a coworker. Shortly thereafter I started receiving cards from you and you remained a signature characteristic of my deployment. I kept the wonderful pictures of the loving and adorable Ciara on my desk throughout my tenure as well. To tell you how your cards have made a difference to my family, I’d like to share with you a little about me. My husband and I have 3 daughters; 6, 12, and 16 years old. Our 6 yr old barely remembers my last deployment (thankfully) as she was only 2 then. Our older 2 girls are blind. With your tactile designs, I have written my girls quite often, always taking care and extensive deliberation over which cards they would enjoy most (best “feeling”). Of course for my youngest I chose cute cards, whether silly or pretty but all associated to aesthetically pleasing. I took mid-tour leave in February, surprising our youngest for her 6th birthday, and found all of the cards I’d sent them! Each girl had her own growing collection that she treasured and could revisit whenever they missed me. Your care and the support of your organization has also touched the hearts of my family and I am forever grateful to have shared this deployment with all of y ou. Many thanks! I want to say thank you so very much for what you do for us troops. These boxes of cards that I have received were well sent home to the families of my battalion. I myself and my mother scrapbook and make cards so I personally know the hard work and effort that go into each individual homemade card. I am sorry that I have not sent an e-mail sooner. It gets pretty hectic here and personal time is at the minimum. I sent my kids and family cards every week. That is one thing that they grew to look forward to. We are now on our last month here, and it couldn’t come any sooner. Again, I speak for myself and many many others when I tell you that we are whole heartily thankful for your kindness! Happy Friday everyone! 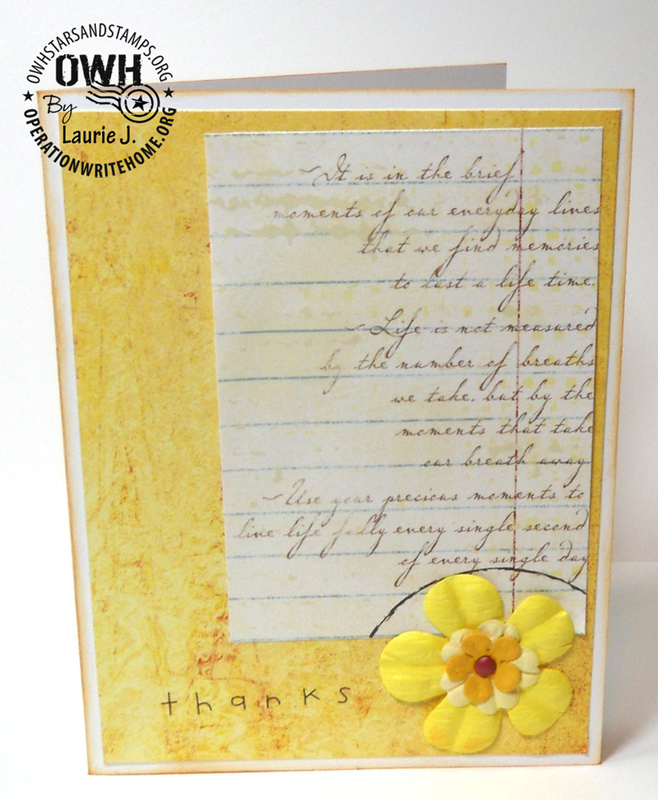 This week I’m delighted to introduce you all to Laurie and to share some of her beautiful cards with you. Laurie isn’t actively blogging at this time so be sure to leave a comment for her here at the end of this post. I am a scrapper first, I don’t really stamp. I’ve been doing some kind of scrapbook endeavor since I was 10 years old (and that has been 40+ years now). But in the recent genres, I have been working with paper since 2007, and digital since 2009. I found OWH in 2009, and my card emphasis started then. Yes, I have an entire room in my condo devoted to my office/craft room. It is big enough to house my den/guest room as well. I love working with embossing folders. I like that I can add texture to papers, so that the designs do not seem so flat. Not really. 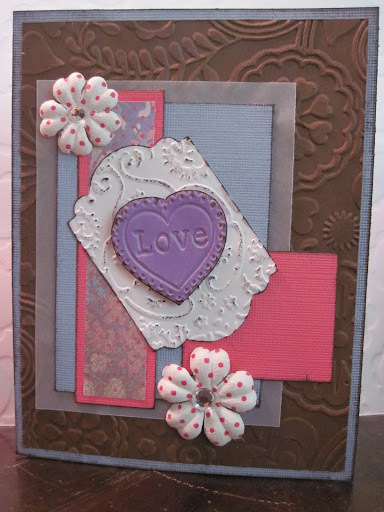 I try to keep my cards simple so that the intended message is imparted and not overshadowed by the materials. All of them??? 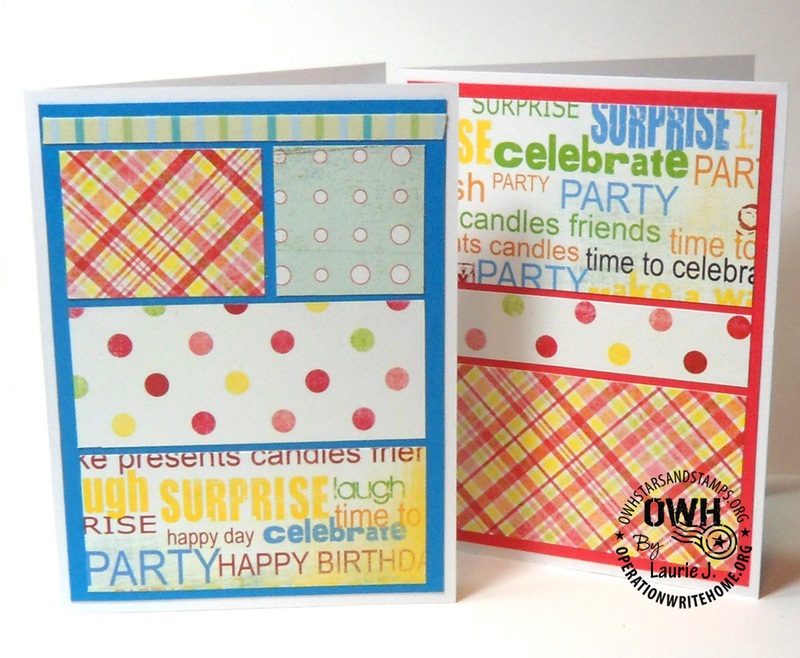 I like bright colors, so it is sometimes hard for me to do masculine and/or fall cards. The more muted colors don’t inspire me as much. Since 2008 I have been participating in a couple of online chat forums. Someone mentioned the Memorial Day blog hop in 2009, and I was hooked! My father is a veteran, as were my first and second husbands. Now my Son-in-Law is in the Air Force. In fact he is scheduled for deployment to Iraq later this year. As an Army brat, my father was away so many of my growing up years, and I know how important the letters going home can be to the wellbeing of both the writer and the receiver. I know that my mom still has all of the letters she received from my dad during the Vietnam conflict. He wrote her a letter everyday without fail. Sometimes she would get one a day in the mail, sometimes it would be two or three, depending on how quickly our mail service worked. But it was her life line to him. These days with texting and emailing, news and communication can be intantaneous, but having the ability to send a special thought for a birthday, or anniversary is so much more endearing in a card than an email. A card can be treasured, just like the letters my mom keeps to this day. And I hope that someday in this next year, my Son-in-Law has the opportunity to find one of my cards to send home to my daugher. In order to remove ads, we had to pay for a subscription. With the popularity of the show, we’re getting enough hours of viewership that it’ll get really expensive really fast. Even with just the live audience, it’ll be pricey, but we’re going to invest and try it! However, after each show, we’ll export it to YouTube – and that’s what you’ll see here on the blog. So please be sure to watch reruns from the blog/YT, so it won’t cost us money for the uStream viewership. We’ll be looking for other less expensive ways to broadcast, as well as sponsors for the show – but so far we just love having the live chat going on and will stay with uStream til we research something new….so stay tuned. The other announcement that wasn’t recorded (sorry! ): the CRUISE! We now have a date, ship, ports of call….and the details are hosted on the CRUISE WEBSITE. 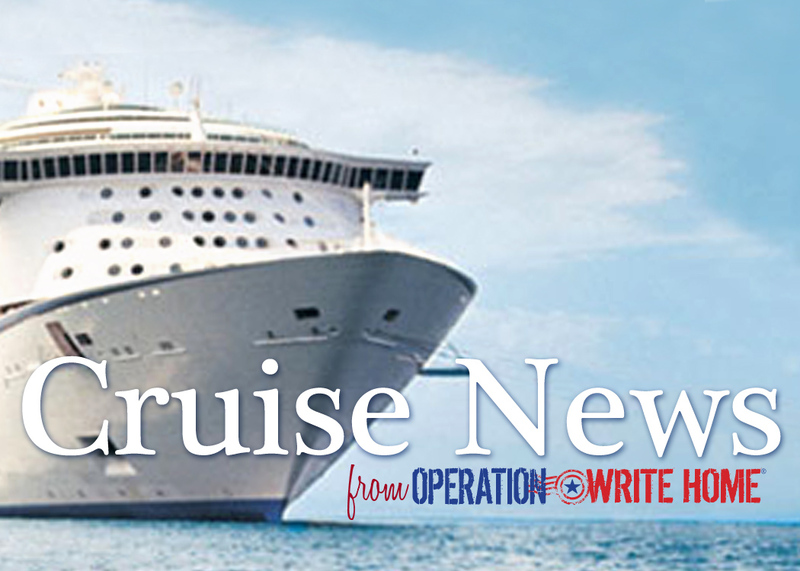 Please bookmark that site, we won’t host the details here on our blog in case we get things wrong – go to the cruise site for the latest details and costs. We plan to have all the supplies donated, so all you have to bring is your personal clothing etc items, and possibly your favorite coloring medium (unless Santa visits us with cases of Copics!). Lots more details will be coming, have no fear. And without further ado…OWHtv for this week! Stick around til the end and hear the beautiful letter at the end…it’s worth the wait!